Thank you for your interest in our Indian inspired Organic and Natural cuisine. Our dishes are prepared with much care for taste and wholesome ingredients. We use Organic and Natural ingredients in every dish. 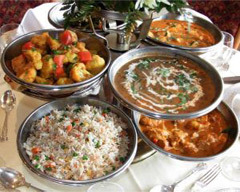 Our love for the traditional Indian style taste and the need for a high level of nutrition is the basis for our recipes.